George Clooney as Danny Ocean in Ocean’s Eleven (2001). According to IMDB, the cast made the most of their time in the gambling capital of America by spending plenty of time at the tables. According to George Clooney, Matt Damon was the biggest winner, but Damon himself says it was Brad Pitt. No matter who won the most, it’s reported that Clooney lost at least 25 hands of blackjack in a row. No wonder Danny stuck to the slot machines. 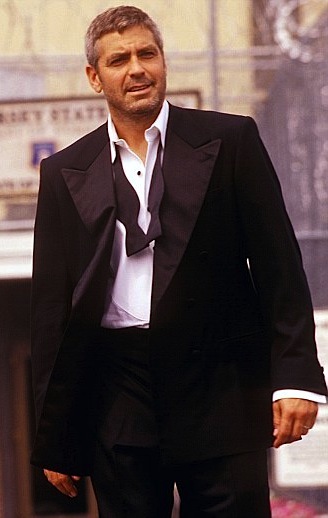 On the evening of the big heist, Terry Benedict (Andy Garcia) and his security team spot Danny hanging out at the slot machines while sporting a black wool tuxedo and a casually untied bow tie around his neck. Once he knows he’s gotten their attention, he straightens himself up and cleans up his appearance as he goes to see Tess. Danny makes sure he looks his best when going to see the ex. Danny’s black dinner jacket is double-breasted with wide satin-faced peak lapels and a low six-on-one button front. All buttons, including the three functional buttons on each cuff, are also covered in black satin. A buttonhole is stitched into the left lapel. Most prisons don’t offer tuxedo-pressing services, much to Danny’s chagrin. The double-breasted dinner jacket has a classic style with the straight padded shoulders offering a strong silhouette with a ventless back. The hip pockets are straight with satin jetting, and there is no breast pocket or any sort of lapel ornamentation. Although he removes his jacket and shirt when carrying out the actual robbery, Danny keeps wearing his formal trousers. It’s a reasonable decision as it saves him both the time and effort of packing extra pants and changing in and out of them. Since he intends to look beaten up by Bruiser, it’s also a practical way to give the trousers some extra wear that the supposed beating would provide. Danny’s formal trousers are flat front with a high rise to the waist and a single satin stripe down the side of each leg to the plain-hemmed bottoms. He has straight pockets which open just behind the side stripes and two jetted rear pockets. Luckily for Danny, his formal trousers still look pretty good with his tactical t-shirt and vest. Danny foregoes wearing a cummerbund, vest, or any other sort of waist covering. Not only would it be an extra garment to deal with during his repeated “costume changes”, but it’s also unnecessary with a double-breasted dinner jacket that entirely covers the waist. Danny wears a white cotton shirt with a point collar and a piqué bib front designed to resemble the formal British Marcella shirt. The shirt takes four large black studs through the bib, which has a rounded bottom. For the most part, Danny keeps his black satin bow tie untied which certainly isn’t the correct way to wear it but is more in keeping with the informality of 21st century Las Vegas. It is a refreshing indication that he is wearing a classic self-tie rather than a pre-tied or – gasp! – clip-on version. When he does tie it, it takes a large butterfly shape. The cuff links worn through the shirt’s non-piqué square French cuffs are silver octagons with mother-of-pearl center settings. Danny reaches into his goodie bag. Danny’s shoes, which he wears with the trousers for both his time on the casino floor and down in the vault, are black leather 4-eyelet cap toe bluchers. Bluchers are typically considered to be too informal with a dinner suit, although patent leather bluchers would be more acceptable than the black calf that Danny wears. Balmorals or oxfords are considered to be the most formal contemporary dress shoes. Naturally, Danny wears a pair of fine black socks that extend far enough up the leg that they’re not seen when he’s flailing around during his faux beating from Bruiser. Wouldn’t he look worse than this after a few hours of sustained beating? Benedict should’ve been suspicious… oh wait, he was. Other than his wristwatches, Danny’s only piece of jewelry is the plain silver wedding band that he wears on the third finger of his left hand. Unlike Tess, he makes no claim to having gotten rid of it. Danny’s wristwatch is a Hamilton Linwood Viewmatch powered by an automatic 25-jewel movement, an elegant, reliable, and practical choice for a man who embodies all three. The round 38 mm case is polished stainless steel, worn on a 16 mm-wide black crocodile leather strap that fastens through a steel tang buckle. The textured silver dial has gold-toned hands, plain gold and black hour markers, and a small date window at 3:00. The Hamilton is Danny’s primary watch throughout Ocean’s Eleven. During the actual heist, Danny wears a second watch – an all-black Luminox with white numerals on the black dial and rotating black bezel. It lacks a sub-dial and is most likely a variant of the Luminox 3000 series, similar to the Luminox 3001 worn by Paul Walker in The Fast and the Furious, also released in 2001. Evidently, the Luminox is standard issue for Danny’s heist team as Linus Caldwell (Damon) wears the exact same one. The actual heist also finds Danny sporting a black cotton crew neck short-sleeve t-shirt and a black leather vest, both of which he was supposedly wearing underneath his formal jacket and shirt. The black leather vest covers his whole torso with velcro straps over each shoulder and a short zipper under the left arm. He also dons a pair of black tactical gloves. Since Danny’s operation is mostly inside and incorporates his black formal trousers, this is a better use of black covert attire than 007 sported in Goldfinger as I featured in Wednesday’s post. Of course, Danny’s overdressing leads to a very entertaining exchange when he leaves the pokey after a few months for violating parole and runs into his much flashier lieutenant. Rusty: (re: Danny’s tuxedo) I hope you were the groom. Danny: (re: Rusty’s awful shirt) Ted Nugent called. He wants his shirt back. Although the scene is meant to evoke the opening of the film when Danny is released from prison in black tie, it should be pointed out that the two tuxedoes are different. Notably, the first dinner jacket is single-breasted with notch lapels. Danny wisely opts for the more luxurious double-breasted dinner jacket when carrying out the film’s climactic heist. Danny’s dinner suit from the opening scene is clearly different than the one he later wears in Vegas. That’s one classy con man! 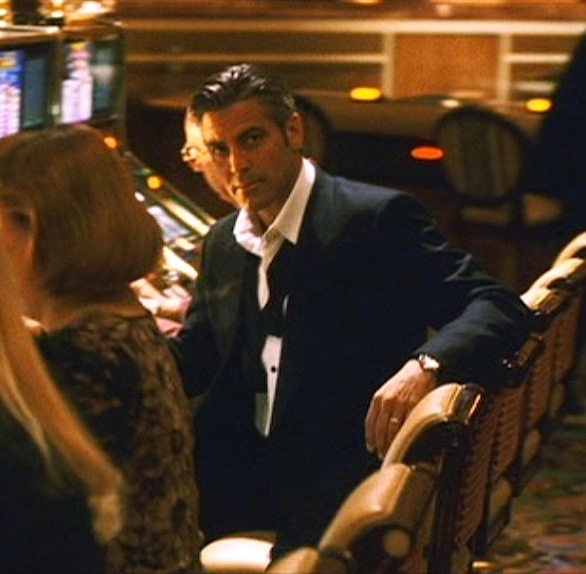 Clooney again sports a black single-breasted dinner jacket with notch lapels in Ocean’s Thirteen during that film’s casino con. Danny Ocean is a throwback to an era of “honor among thieves” before a trip to Las Vegas meant seeing old t-shirts and ratty cargo shorts. You’d be hard-pressed to find any other man in this day and age who takes so much pride in his appearance while committing a crime. There’s a ninety-five pound Chinese man with 160 million dollars behind this door. I thought I was so clever by putting this Ocean’s Eleven post on October Eleventh. If anything, I’m just a nerd. All these years, I thought he might have been wearing a Jaeger-LeCoultre Master Control series or Omega DeVille, although I don’t think he was an Omega ambassador at the time he did “Ocean’s Eleven”. I should have guessed that it was Hamilton, since it’s a go-to brand for Hollywood movie stylists and wardrobe departments. The Viewmatic is a nice watch, too. I’ve been tempted to get one.